Most times I feel like a cookie I'm craving something simple; say an oatmeal-based one with crispy edges and chewy centre, perhaps something buttery dotted with nuts and chunks of chocolate. But every now and then I crave something more elaborate, and that's when the two-for-one cream-filled variety gets a run. Cream-filled biscuits are one of the food world's many personality-type indicators—do you eat pizza crust-first or -last? ; prefer the top or bottom half of a hot cross bun? ; eat your fruit crumble with ice cream, or custard?—I, for one, am a twister, whatever that may or may not say about me. 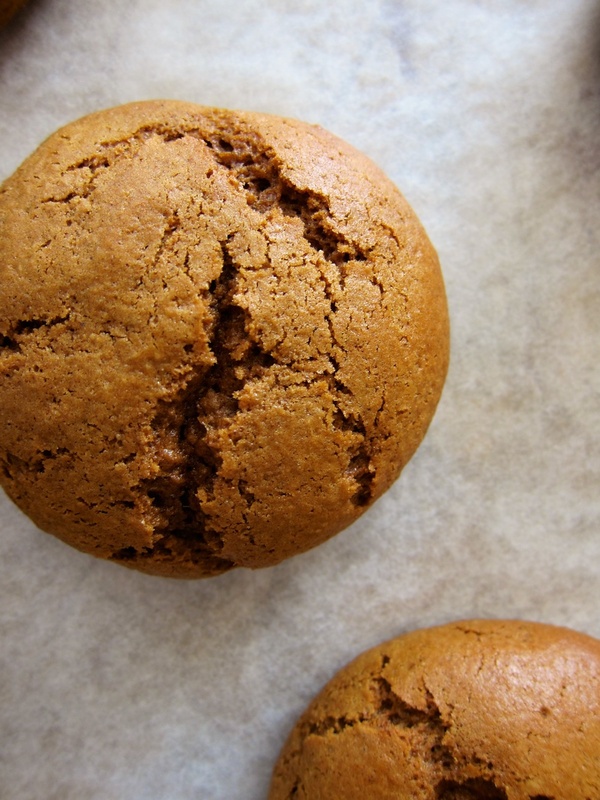 As it happens these molasses cookies are perfectly suited to such a practice, with a ginger cream filling sufficiently soft that it will likely ooze out in all directions should you approach them in any other manner (that said it does actually firm up, if you're able to wait a few hours). However you choose to tackle them, though, when it comes to flavour they're a real winner. The heat of the ginger marries perfectly with the bitter tang of molasses and warmth of the cinnamon, nutmeg and clove, and they make for a great, punchy accompaniment to that afternoon cup of coffee or tea. 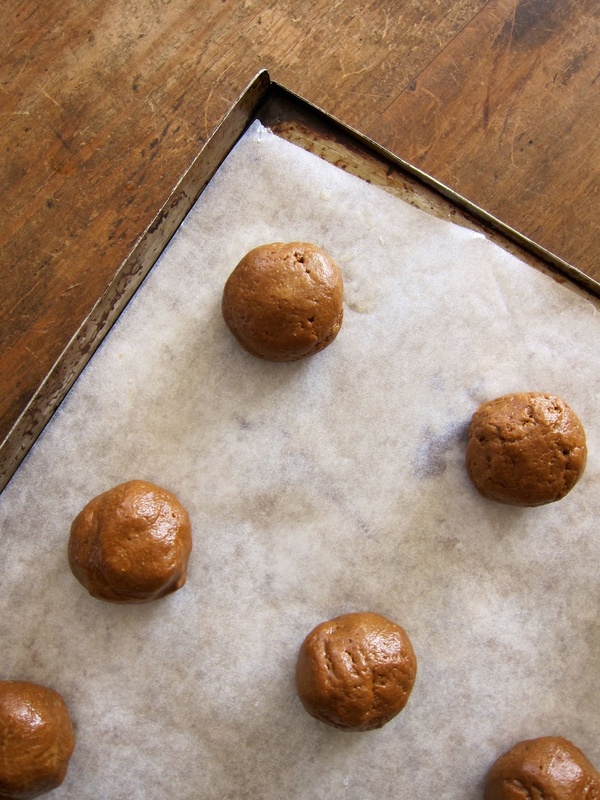 If you're a fan of the classic ginger nut/snap, these molasses cookies are definitely for you. To make the cookies, cream the butter and sugar until light, then slowly add the eggs and molasses. In a separate bowl sift together the dry ingredients then add to the butter mixture and mix until just incorporated. Using wet hands, roll tablespoonfuls* of dough into balls and place on a baking sheet lined with paper. Bake at 180°C for around 15 minutes, until just beginning to colour. Transfer to a wire rack to cool completely. Meanwhile, make the filling. Beat together the butter and cream cheese, until smooth, then mix in the ground ginger and salt. Gradually add the sifted sugar, beating until the mixture is smooth and thick. Stir through the candied ginger and set aside. To finish the cookies, spread a heaped teaspoonful of filling (or pipe it, if you prefer a smooth edge) on the underside of a cookie and sandwich together with a second cookie. Repeat with the remaining cookies and dust with icing sugar, to serve. Cookies are best eaten within a day or two after baking. Store in an airtight container at room temperature. ** This will make seven rather large cookies. Use heaped teaspoonfuls and reduce the cooking time to 8-12 minutes, if you prefer.